I was perusing the peppers one morning when I caught myself eavesdropping (as usual) on a conversation between a farmer and his customers at the market. I had a few clues as to what they were discussing — though they were chatting in Spanish — as he picked up the uniquely orange watermelon and handed them samples of its fruit. But what caught my attention most was the wide smile across his face and the way it was contagiously spreading to the customers. He could have been feeding them raw kohlrabi, I think, and they still would have been smiling. 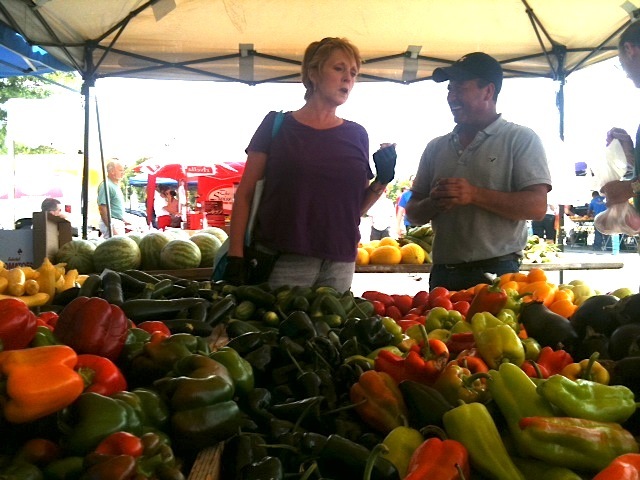 Jesús discusses recipes with a customer at the market in Lorton on Sunday. 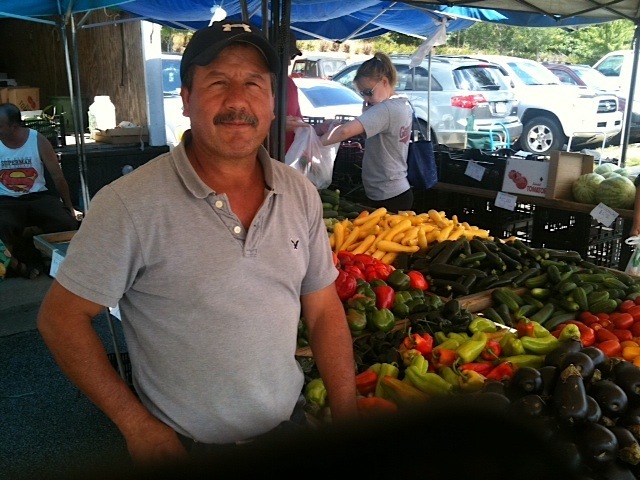 After observing this farmer, who I now know as Jesús Ochoa, at both the Wednesday market in Mount Vernon and the Sunday market in Lorton (my regular stomping grounds), I learned that he’s always this way. Unlike the array of produce he sells on behalf of Laurel Grove Farms in Westmoreland, his smile doesn’t go out of season. (He also sells at Arlington’s Saturday market). Jesús has been growing and selling produce at the markets for some 20 years, along with nearly all of his family members. He is from Guadalajara, Mexico, where his first daughter was born, and he has been in the states since ’85. He has two other daughters, including a 9-year-old who loves to draw the price signs for the markets on Friday nights. His teenage son runs the register at the Lorton market and others while he’s out of school in the summers. His wife, son-in-law, nephew, etc. also work in farming and direct market sales. Do you own the farm? What do you like about working at the markets? “I like the markets. My first time, I sold flowers. Then I sold vegetables with my sister-in-law. I’ve been selling full-time (for) four years now. I do everything. Right hand man,” he says, then he smiles. Do you have any favorite recipes for your produce? “Tomatoes. I make salsa with jalapeño, cilantro. I like it spicy but not too spicy. 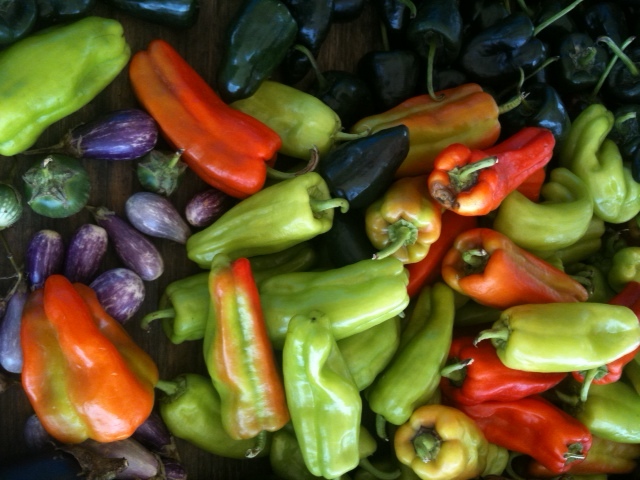 A smattering of the peppers (and some precious baby eggplants) for sale at Jesús’ market stand. Are you sure it’s not ‘too spicy’? Because I’ve had your serranos and they’re much hotter than the ones at the grocery store. 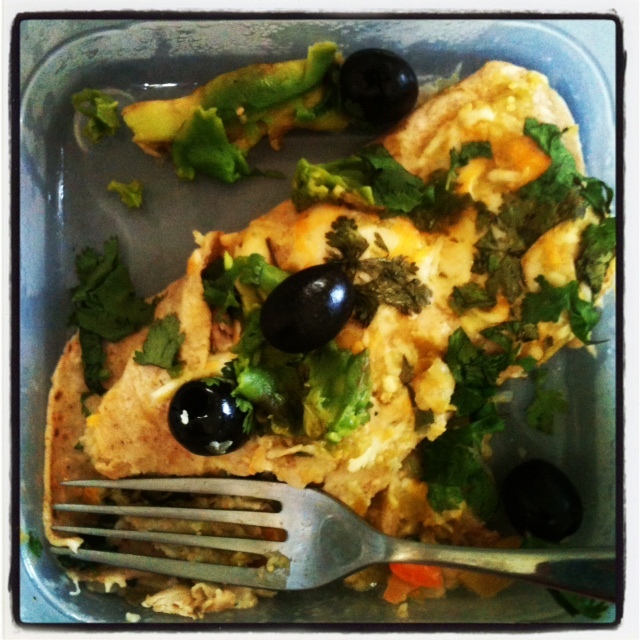 The enchiladas I made with Jesús’ serrano peppers in the tomatillo salsa… woowee were they spicy! He said “next time, use just this much of pepper,” gesturing with his fingers about 1/8 the pepper. I modified a recipe from Simply Recipes. ← Do GMOs have a role in the next food frontier?